Balcony collapse kills five people, and seriously injured eight more. An apartment balcony in Berkley , California has collapsed, killing five people, and injuring eight others. When fourth floor balcony suddnely collapsed with people on the balcony, four people were killed immediately and another one has died at the hospital. Eiight others are injured, many of them are in critical condition. The injured people were all Irish students here on a visa, and they were celebrating the 21st birthday of one of the students at the time of the collapse. 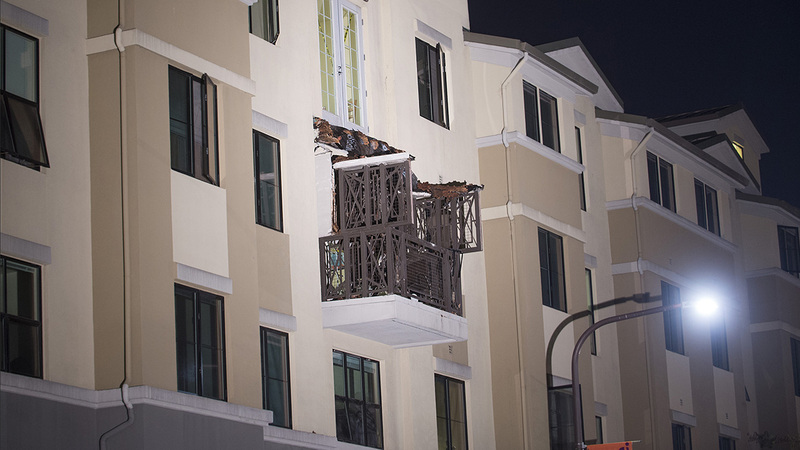 Police report that the balcony just "disintegrated"; but they are not sure what caused it to collapse and fall onto the third floor balcony , which was directly beneath the one that collapsed. There's a similar thread here: https://www.disaster.com/forums/foru...lcony-tragedy/. Anyhow, what a tragedy that was. To visit Berkley only to be met with such an incident. I can't fathom this dark situation. Prayers to those students. Oh, oh, that balcony should have been repaired. More probably it has already some indications of that problem but just ignored. In our house, that's what I always check - parts of the house needing repairs like stairs and door which are very important. They can cause injury to people if left in that risky condition. A leaking roof is also a risk but if the leak is not much then it can be repaired later. That balcony was not very big and there were at least 13 people on it. Look at this picture and ask yourself if 13 (or more) people should have been on it. Given that they were attending a 21st birthday party, it is a pretty safe bet that they were dancing or jumping around too. While I pity the victims and their families, they could have avoided this tragedy by not overloading the balcony. It may or may not have had structural flaws, but a regular cantilever balcony like that is simply not designed for that amount of weight. Unfortunately, youth and alcohol can be a deadly combination. As always, Jim, you are right on the money. In fact, I was just reading this AP article that includes an interview with a structural engineer that echoed your same thoughts. Balconies of that size are only built to withstand a certain capacity and the article also confirms your suspicion that they were dancing and making a lot of noise. The exact dimensions of the balcony that failed were not released. Estimates varied, with Mayor Tom Bates saying city officials thought it was about 9½ feet by 5 feet, while Grace Kang, a structural engineer and spokeswoman for Pacific Earthquake Engineering Research Center at Berkeley, said it looked to her to be 4 by 6 feet, or 24 square feet. The larger estimate would mean the balcony should hold 2,850 pounds, while Kang's estimate would be half that. Kang said it appeared small for 13 people. "They were packed like sardines, and then they were moving," Kang said. When people are moving it "may further exacerbate" the strain. Ehh ?? What were 13 people doing on a 5 foot by 10 foot balcony , 4 stories off of the ground. That's approx. fifty feet. Looks liek they were they dancing too.That's close to 2500 lbs. And that's just static load.Any balcony would crash under those circumstances.That is painfully insaneMy thoughts and condolences. Apparently, the company that built this balcony was already sued and paid several million dollars out, just because of poor construction , for another property that they worked on. Even though the balcony was definitely overloaded; it is likely that the builder will now find themselves embroiled in yet another lawsuit for the collapse of this balcony. If the balcony was seriously over the weight that it should have been able to carry, it may be pretty hard to prove that the builder is at fault, in spite of the previous judgement against them. There are many buildings that are getting older each year especially in areas that experience after shocks from earthquakes. If there is already a minor crack anywhere in the building I think there needs to be professionals immediately in the area making sure that everyone is out of the building. I remember a while ago there was a hotel which collapsed in second because there were several cracks developing in the first floor hallways. The building was old but since our technologies develop everyday that building decided to add air conditioners on the roof. This was the feather that broke the whole straw tower and many lives were lost. Therefore It is extremely important to contact professionals if you see cracks anywhere where you live or elsewhere. This is really horrible. But how on earth a balcony can fall like that. There were definitely some structural faults with that balcony. Coupled with it overload accelerated its fall. As already pointed out earlier these students must have been very active there as it was a birthday party. I think all balconies in that building needs to be closely checked for any more structural issues. This can prevent such dangers in future.